They are prosecuted for « helping undocument foreign nationals to enter national territory, in organized gang”. The envisaged penalty is 10 years in prison and 750.000 euros fine. What should they amend for ? Being involved in a march against the far-right, little band called « Bloc identitaire », which was obstructing the border the border so as to retaliate against migrants trying to cross it. Even though the notion of « organized gang” was meant to tackle organized crime, it is now being used against volunteers involved in the NGO’s Tous migrants and, as for two of them, La Cimade. More generally, this provision is now being misused as a tool to intimidate citizens who show solidarity with migrants trying to cross the French Alps. The prosecutor’s office has, hence, chosen to prosecute pacifist activists while enabling the far-right activists of “Bloc Identitaire” to evade punishment, as they didn’t face any charges. Echoing a recent French Constitutional Court’s ruling, which enshrined the principle of fraternity as a constitutional principle, we are calling for the dropping of all charges against Bastien, Benoit, Eléonora, Juan, Lisa, Mathieu, and the end of any prosecution against them. 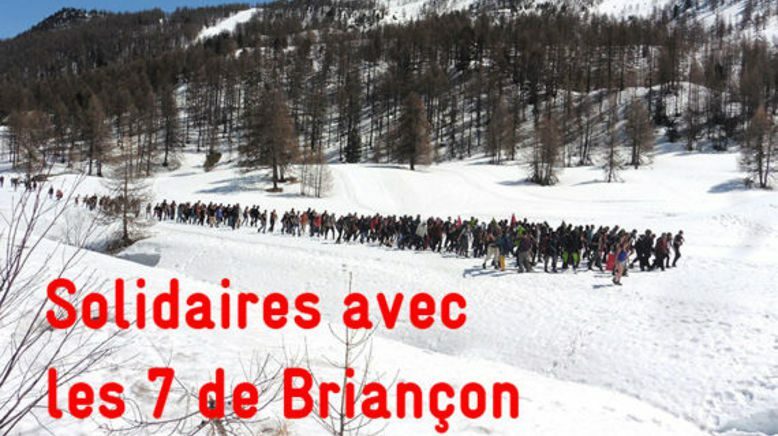 Solidarity with the « 7 of Briançon »! We all stand against the “crime of solidarity”! We are all criminals for being solidary in “organized band”! Petition on the initiative of Comité de soutien aux 7 de Briançon, La Cimade, Collectif Délinquants Solidaires, Gisti, Anafé, Tous Migrants, Emmaüs, UJFP (Union juive française pour la paix), Fasti, Bagagérue, FAP (Fondation Abbé Pierre), Transport People and Care, Syndicat des Avocats de France, LDH (Ligue des droits de l’Homme), Union syndicale Solidaires, SUD Education et L’Auberge des Migrants.